Taber Golden Suns Athletic Association celebrated its programs at its year-end awards banquet last week at the Taber Community Centre Auditorium. 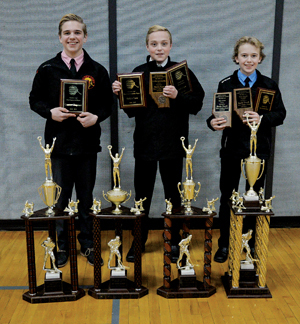 Peewee, bantam and midget Suns teams selected its team award winners where some players also got league-wide recognition for their contributions to the 2018/2019 South Central Hockey League season. The dynamic duo of Kade Duell (46 goals, 53 assists) and Aidyn Law (35 goals, 47 assists) helped headline overall scorers in the league during the regular season in which the SCAHL took notice. Duell’s 99 points in 32 regular-season games had him at the top of the heap for SCAHL scoring, giving him the Top Scorer and Most Valuable Forward in the SCAHL peewee division. For team awards, he was also given MVP. Duell went wild including the playoffs, getting nine more goals and 15 more assists to his tally. Law finished in the top-five in scoring during the regular season, and did that with leadership and demeanor qualities that earned him Most Sportsmanlike for peewee SCAHL. Law was able to fill the stat sheet, including 13 goals and eight assists in the playoffs while only drawing an amazing six penalty minutes over 33 regular-season games, despite heavy attention by the opposition. Law earned Most Sportsmanlike and Player’s Player in the team awards as well. “Aidyn Law is a special kid in my mind. He just as easily could have been our MVP just as much as Duell was. The way he carried himself in the dressing room, and everything he did was exceptional in my opinion,” said Serfas. Not a ra-ra type of player according to Serfas, Law’s laid-back demeanor gelled well in the peewee Suns’ locker room that earned him the Player’s Player award. “The kids responded well to that and is probably why they respected him so much. Aidyn showed emotion, but in a very different way,” said Serfas. In the bantam division, Scout Sidam was given SCAHL Best Goalie honours. Coaches get to put players’ names forward for the various league awards where votes are cast and you cannot vote for your own player.